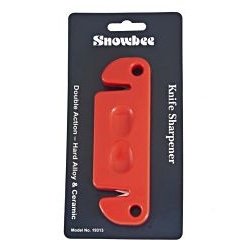 Double action knife sharpener, with hardened alloy sharpening plates one end and ceramic the other. Rugged moulded construction, with finger 'grips'. Works well, the steels certainly add a keen edge. The ceramic part seems to be for show as the blade does not seem to contact it. An ideal way for those unskilled with an oil stone to put a good working edge on knife blades!&nbsp;These work quite simply 6-8 pulls through the steel side followed by 6-8 pulls on the ceramic side to hone.&nbsp;Does what it says!